Now that China has released details on its planned retaliation to President Trump's Section 301 tariffs - a list that contains, predictably, agricultural goods like soybeans, orange juice and beef as well as energy products like crude oil (though surprisingly not yet aircraft, though sanctions could be imposed in the next round) - we get to watch as US corporations who will be negatively impacted by the tariffs ratchet up their lobbying of the Trump administration (that is, if they haven't already given up) practically beginning the president not to let tensions escalate much further. Of course, the Chinese aren't stupid. They know that one way to pressure Trump into backing off would be aggressively lobby US businesses with threats - both veiled and obvious - that their businesses could come to harm, or perhaps ruin, if the conflict escalates. Already, the Wall Street Journal has published a story about China's efforts to browbeat American businesses, recounting a meeting between a group of executives and Chinese Vice President Wang Qishan that reportedly took place in late March. When a group of American executives and other global corporate chieftains met with Chinese Vice President Wang Qishan in late March, they received a stern message about the simmering U.S.-China trade conflict: If tensions escalate, buckle up. "The message was pretty clear," said a person who attended. "A lot of companies would become victims in a U.S.-China trade war." And some companies say they're already experiencing problems with the customs process as US goods pile up at Chinese ports. Already, some U.S. companies are facing increased regulatory scrutiny in China, according to Jacob Parker, vice president of China operations at the U.S.-China Business Council. For instance, he said, it takes longer for their products to clear Chinese customs; in other instances, Chinese regulators are putting advertisement slogans by U.S. firms under review. Some automobiles and farm products such as pork from the U.S. have piled up at ports. "Maintaining a low profile in the China market and ensuring that you’re completely compliant are more important now than in the past," Mr. Parker said. Others, including Foxconn, a Taiwanese technology company that is best known for assembling Apple's iPhones, have begun reviewing their supply chains. While multinationals assess the potential impact from the escalation of trade tensions, makers of consumer electronics have been canvassing suppliers and, in the case of at least two personal-computer makers, inquiring about shifting some of production in China to the U.S.
Foxconn Technology Group of Taiwan, the world’s largest contract manufacturer of electronics and known for assembling Apple Inc.’s smartphones in China, conducted a review of its supply chain, said a person familiar with the matter. The review, which assessed the proficiency of Chinese suppliers, could be used to assess the impact of potential tariffs, the person said. It isn’t clear if Foxconn is taking any action following the review; the company didn’t respond to a request for comment late Friday. There's also the danger that Trump's tariffs could inadvertently harm foreign firms who have ownership stakes in companies that are producing Chinese electronics and other goods, as the chats below show. As a reminder, a few months ago, we published a post citing research from Credit Suisse about which sectors and companies could be harmed by the trade war - highlighting companies that generate a lot of their revenue from their business in China. 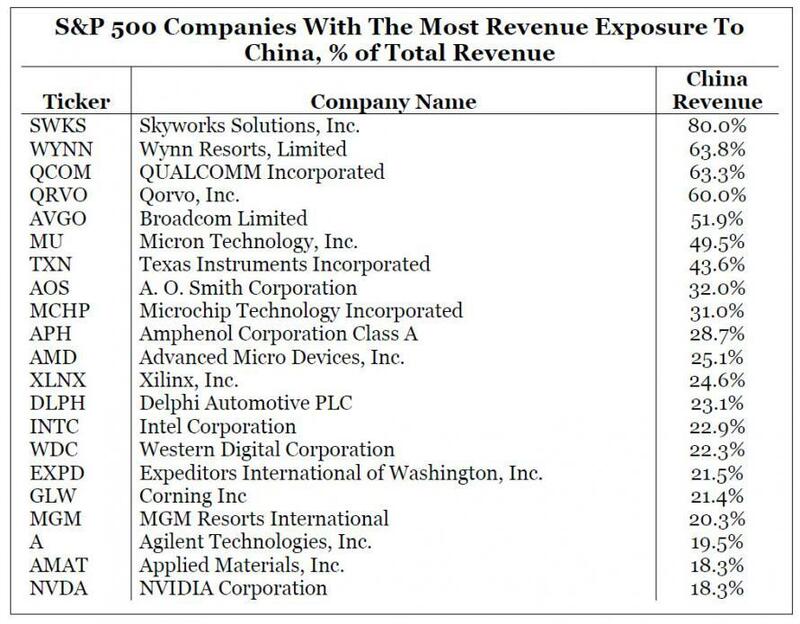 To wit, here's a list of the S&P 500 firms with the largest revenue exposure to China. And here's a snapshot of key aspects of the US-China trade relationship, which show that A) the US exports soybeans, pharmaceuticals, vehicles and aircraft to China while China B) exports textiles, electronics and toys. And as it happens, one of the first firms to face a serious threat thanks to the trade war is mentioned on the above list: Qualcomm's planned $44 billion buyout of Dutch firm NXP Semiconductors - a deal seen as vital to Qualcomm's survival - is now in jeopardy as Chinese authorities, who must sign off on the deal, are expected to withhold their approval. Also hanging in the balance is Qualcomm’s planned $44 billion purchase of Dutch company NXP Semiconductors NV, a deal widely seen as critical for the U.S. chip maker. Late last month, amid signs of progress in trade talks by Washington and Beijing, Chinese authorities indicated their intention to wrap up the review and clear the transaction. Momentum, however, stalled following the White House decision to move ahead with tariffs and congressional pushback against Mr. Trump’s decision to save China’s ZTE Corp . from crippling punishment for violating U.S. sanctions. "The anticipated escalation of trade tensions will complicate China’s ability to approve the Qualcomm-NXP transaction from a face-saving perspective," said Stephen Myrow, a former Treasury official in the George W. Bush administration who is now managing partner of Beacon Policy Advisors LLC., a U.S. research firm. Unfortunately for these companies, it's unclear how much influence they can have as both sides are determined to maintain the appearance of resilience in the face of their rival's threatening rhetoric. The trade truce called last month by Treasury Secretary Steven Mnuchin has been broken, and three rounds of trade talks have failed. In other words, the die has been cast. The U.S. is stepping up its trade offensive over what the Trump administration alleges is Beijing’s pressure on U.S. firms to transfer technology to Chinese companies. In doing so, the U.S. is effectively ending a truce called late last month by U.S. Treasury Secretary Steven Mnuchin and China’s chief trade negotiator Liu He, following the second of three rounds of talks. "Three rounds of negotiations with Beijing have failed to delay or prevent this outcome," said Tai Hui, chief market strategist at J.P. Morgan Asset Management. "The threshold to come to a consensus or a compromise seems high." In what has become a common complaint (as we have seen in the debate over immigration policy) about how the Trump administration handles its business, Chinese officials reportedly told WSJ that they've found it nearly impossible to negotiate with an administration that's constantly shifting its positions. Some Chinese officials said they are feeling frustrated by the Trump administration’s shifting positions, which they say have hurt the credibility of the U.S. government. The U.S. is “provoking the trade war,” Chinese Foreign Ministry spokesman Lu Kang said Friday night. Washington’s latest hard-line approach, Chinese officials said, isn’t going to wring concessions from China. In addition, Beijing has been left incredulous by the US's insistence that China scale back its Made in China 2025 initiative - a state-directed strategy meant to upgrade the country's industrial sector into higher-value manufacturing like robotics and aerospace. The program - which Trump has targeted to prevent the "unfair transfers of American technology" that his administration has cited all along as the justification for its trade push - is a favorite of President Xi Jinping. "It's wrong for the US to think its pressure tactics are working," said a Beijing official. But if Trump's ultimate goal is the opening of the Chinese economy, there could be opportunities for both sides to save face in the future, particularly as a wave of destabilizing inflation starts hitting consumers. President Xi Jinping and Vice Premier Liu He have already slashed passenger car duties and said they would begin to allow foreign manufacturers to operate without Chinese partners. Though car manufacturers have complained that the measures don't go far enough, if history is any guide, if there's an easy resolution to be found, it lies somewhere at the intersection at China's baby-step's toward liberalization, and President Trump's love of taking credit.